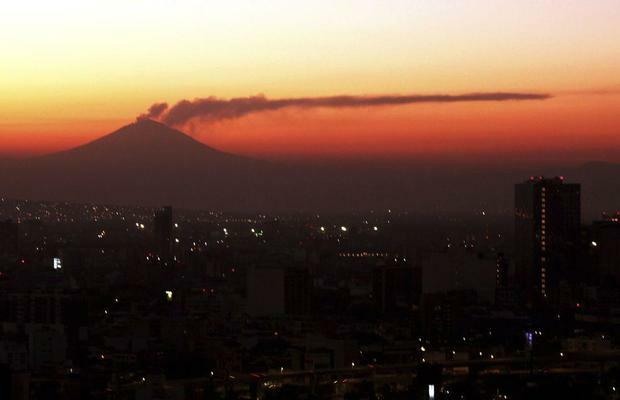 MEXICO CITY, March 28 (Xinhua) -- Mexican authorities on Thursday raised the threat level of the Popocatepetl volcano following changes in its pattern of explosions, which have resulted in increased expulsion of incandescent material. The Volcanic Alert Semaphore went up from Yellow Phase 2 to Yellow Phase 3, or from intermediate to high activity level, meaning that authorities and the nearby population need to be ready for possible evacuations. It is a preventative measure with recommendations for local governments so that they have evacuation routes, shelters and transport protocols ready, national civil protection coordinator David Leon told a press conference. "The evacuation in this stage is ruled out," said Leon at the headquarters of the National Center for Disaster Prevention (Cenapred) in Mexico City. Popocatepetl volcano is located in central Mexico, some 60 km south of the capital. The volcano has been active since 1994 and is considered one of the most active on the planet. The volcano produces steam and ash exhalations on a daily basis, however, in the past two weeks spectacular and thunderous explosions accompanied by magma fragments have fallen within a radius of 4 km from the crater that resulted in forest fires. Some 40,000 people live within 15 km of the crater and close to 25 million with a radius of less than 100 km, according to Leon.